Panasonic announces two new MFT lenses: Leica DG 100-400mm f/4-6.3 and Lumix G 25mm f/1.7! Black GX8 at Amazon, Adorama, BHphoto and Panasonic. In Eu at WexUK. Silver GX8 at Amazon, Adorama, BHphoto and Panasonic. In Eu at WexUK. FZ300 at Amazon, Adorama, BHphoto and Panasonic. Post Focus will enable users to select an “in-focus” area after shooting with a simple interface. This function has been developed as a further evolution of 4K Photo technology to prevent out-of-focus errors and offer additional creative freedom. By combining high-speed, high-precision DFD (Depth From Defocus) auto focus technology and the 4K Photo burst images in 4K resolution are shot at 30 fps while shifting the lens to set focus on approx.50 areas (*TBC). With the Post Focus function, the best image can be selected from the 4K burst images shot with different focus areas. Once the composition is fixed, you are free from the job of serious focusing. In addition, this function can be used for creative photography such as landscapes or portraits. Users can pull different impressions out of one picture by changing the subject to enhance it with focus. The operation of the Post Focus function is quite easy – just touch the point where you want to set focus while playing back the image, no matter where the original focus area is, and the image with different in-focus area will be produced as a separate photo. •Service specifications are subject to change without notice. 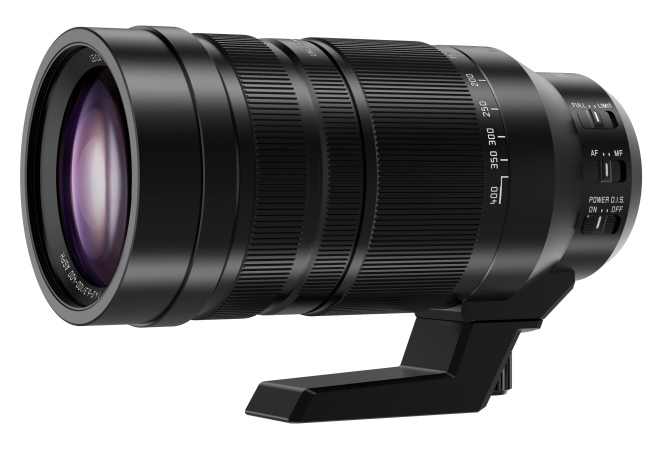 Panasonic is developing the first LEICA DG 100-400mm / F4.0-6.3 telephoto zoom lens (35mm camera equivalent: 200-800mm) for the Micro Four Thirds system standard to expand the lineup of DSLM (Digital Single Lens Mirrorless) digital interchangeable lenses. The LEICA DG lenses are designed and developed under the stringent quality standard certified by Leica that boast excellent optical performance. Four single focal length LEICA DG lenses have already introduced to the market and have been highly acclaimed by users worldwide. The new telephoto zoom achieves exceptional imaging performance over the entire zoom range. It also features high speed digital signal exchange at 240 fps to comply with the high-speed, high-precision AF (Auto Focus) with DFD (Depth From Defocus) technology on LUMIX G cameras. Together with the POWER O.I.S. (Optical Image Stabilizer), it lets users to focus on the target quickly to capture crisp, clear images. In addition, the new lens is both light and small and is splash/dust-proof to withstand heavy field use. As the new telephoto zoom lens excels in size and weight, it enables handheld 800mm (35mm camera equivalent) telephoto shooting without using a tripod. •The photos show images of the product which may differ from its final appearance. •SUMMILUX, ELMARIT and NOCTICRON are all registered trademarks of Leica Camera. Panasonic is developing a LUMIX G 25 mm/F1.7 single focal length lens. This lens is a 50mm (35 mm camera equivalent) single focal length lens with a large diameter. The 50mm focus distance offers almost the same viewing angle and sense of perspective of human eyes which means users can enjoy shooting a portrait or scenery as they see. The new lens also supports high speed digital signal exchange at 240 fps to comply with the high-speed, high-precision AF (Auto Focus) with DFD (Depth From Defocus) technology on the LUMIX G cameras. Panasonic will continue to further advance its product development to meet the diverse needs of customers in the expanding digital mirrorless camera market. * Details of the product specifications, the date of release and the price are not yet finalized. • The photos of the product may differ from its final appearance. next post: Full Panasonic GX8 and FZ300 press kit for download (with full size images and spec sheet).